The Bennington "Buy Early and Save" event is saving you $3500 off the price on this model! Purchase before Feb 11th to take advantage of these extra savings! Starting at $34,499 + freight/setup (after cash incentive), plus optional features. This package includes a 24' Bennington Tri-Toon, Mercury 115 EFI Fourstroke, upgraded tandem axle trailer with brakes, custom cover and bimini top, and so much more, water-ready for you! Add $1399 and you can get an option package that includes docking lights, livewell, built-in fishfinder, upgraded captains seat, and LED lighting in the bimini, for a tricked-out Bennington! Pictured model shows some optional features. Why buy this model? You have a large group of people to entertain (13 capacity) with different activities like: Lounging, Cruising, Fishing, Tubing, and Swimming. The Tri-Toon Package adds the additional buoyancy of a third large diameter float, which creates lift and adds ride heigth, allowing super-quick times to plane, increased acceleration, greater fuel economy, and faster top speeds. Included for no extra charge with our tri-toon package is "Wave Shield." Wave Shield deflects water spray at the bow, keeping you dry on board, and also deflects water downward underneath the pontoon, for an uncompromised quiet ride and no typical pontoon speed-surging. Ask us for more details. Add the popular Ski Tow Bar to this one for $599, and elevate your towing experience! Bring your friends with because there is seating for 13, including THREE reclined Chaise Lounges with loads of storage beneath. All upholstery is soft-touch, including the sun station. The driver's console exhudes class with it's curved tinted windscreen and complete fiberglass console (no plastic consoles here). A Tiger-Polished 15" steering wheel, custom sterling gauges and controls, illuminated rocker switches with circuit breakers instead of fuses, a 12 volt power outlet, and teak dash panel accents add to the feel. Need some tunes? How about a Sony GT Series CD and MP3 player. Let's do four Ultimate speakers, not just two. How much extra is that? ZERO! It's included. This Bennington model boasts high-performance carpet throughout, with non-skid Tuff-Ply vinyl flooring in the stern boarding area for easy cleanup. You will love the rear platform that's close to the water. How about fishing? Add some popular options like the livewell, fishfinder, and rod storage box to elevate your fishing experience. Fishermen love the rear vinyl floor, as do the ones who clean up after fishermen. Across from the driver's seat is the L-wraparound picnic and lounge area, with kidney-shaped table, duraframe seat bases, and a reclined chaise lounge for cruising. Mom will love that! Kick back, feet up, relax. Every Bennington pontoon comes with a custom color-matched 10' Surlast bimini top with quick-release fittings & trailering struts, embroidered boot, and powered stern light. Most of the competition have 6-8' length bimini's, which offer little protection from the hot summer sun. Every Bennington also features a deep-step, fold-down boarding ladder at the stern, making re-boarding for anyone a breeze! What else will you like about this one? 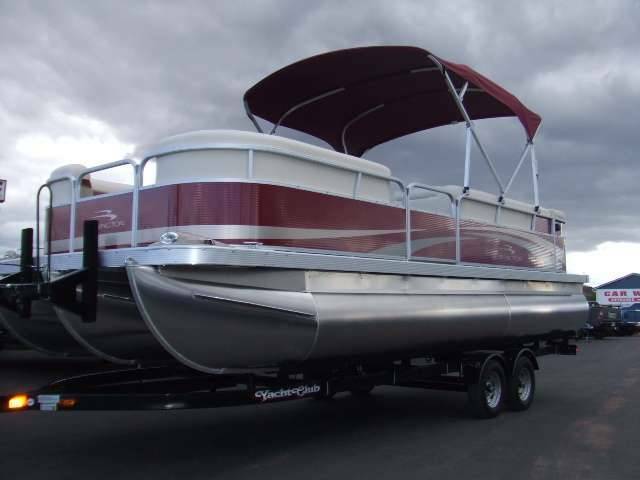 It has large 25" pontoons, a built-in 24 gallon fuel cell, a soft-side insulated cooler, lockable storage aboard, powder-coated seat hinges, stainless cleats, sealed deutsch connectors on wiring, stainless steel thru-bolt decking with nyloc nuts, and so much more, plus the industry's best and most comprehensive warranty! Choose your engine! It is priced with a Mercury 115 ELPT EFI FourStroke. Contact us for downgrade prices like the 40-75 HP. The 90 HP EFI Fourstroke downgrade savings is $700, so if you don't need higher power but want a great cruising motor, deduct $700 from the price. Or you do have the option of upgrading to the 150 Mercury FourStroke for $3499 more. You pick the power that suits your needs. We don't put cheap trailers under our pontoons! This is a 8.6' wide tandem axle pontoon trailer with brakes and full-sized tires and wheels, and a Free Trailer Upgrade Package (F-TUP). Your F-TUP includes rear trailer loading step pads, a deluxe winch stand with wide-bodied ladder and dual hand rails, and loading guide-ons. Compare if you dare.